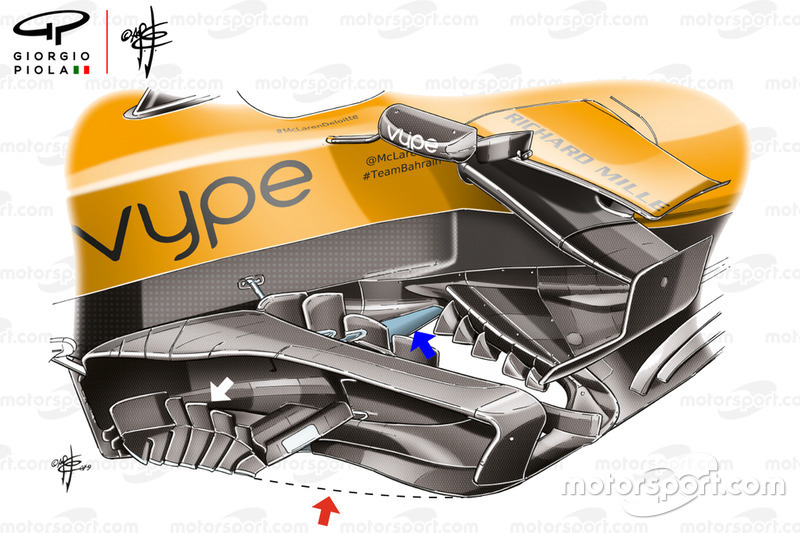 McLaren introduced a new bargeboard arrangement in Bahrain and seemingly unlocked some of the untapped potential of the MCL34. The new design’s forward footplate shape was revised quite significantly (red arrow and dotted line), while a series of variously sized vertical fins (white arrow) that we’ve seen others use for some time now were added. 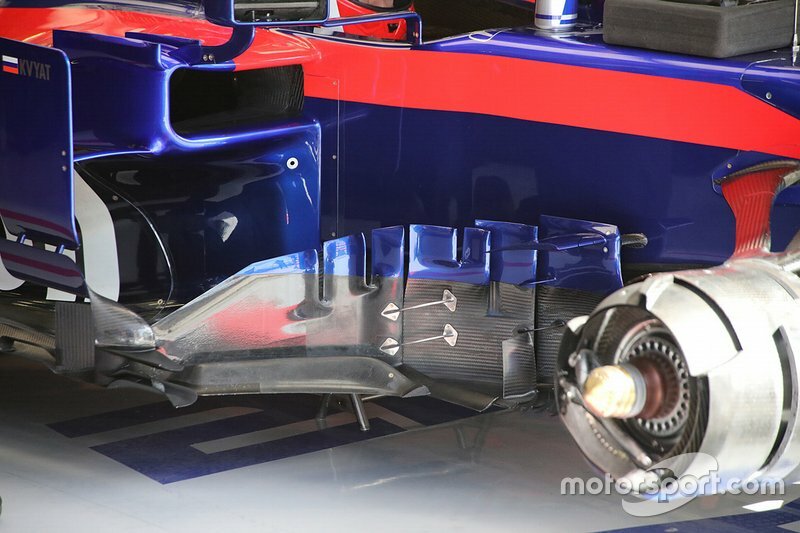 These make up a sort of pre-bargeboard arrangement and help to guide the airflow in that region. Behind the bargeboard the splitter (blue arrow) has also been extended in order that it interacts more effectively with the floor behind. Renault made a small change to its front wing in Bahrain installing a new infra-red tyre temperature sensor within a winglet on the edge of the endplate. It’s only unusual when compared with the other teams, as most have opted to place a sensor in a more forward position on the endplate, as we can see from the Alfa Romeo design (inset). 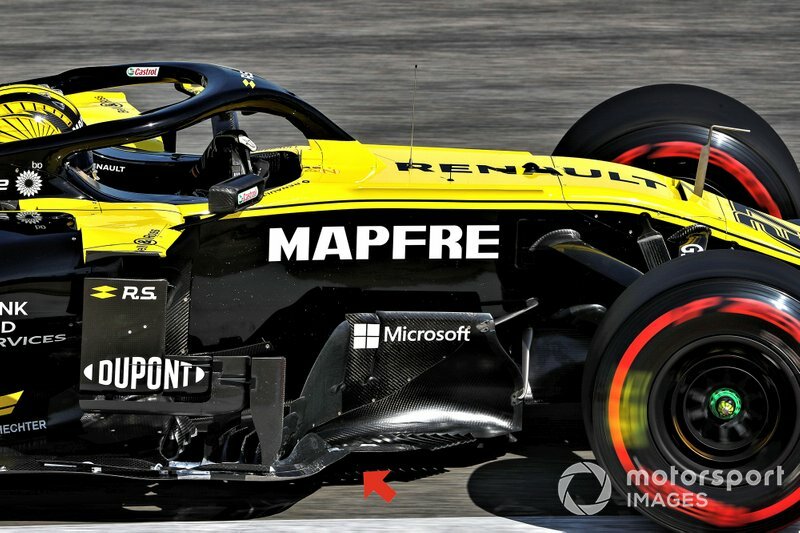 Having started with an overall front wing design on a similar end of the spectrum to Mercedes, Renault is using the shape of the housing to alter the high energy vortex that’s formed at the front wing tip. 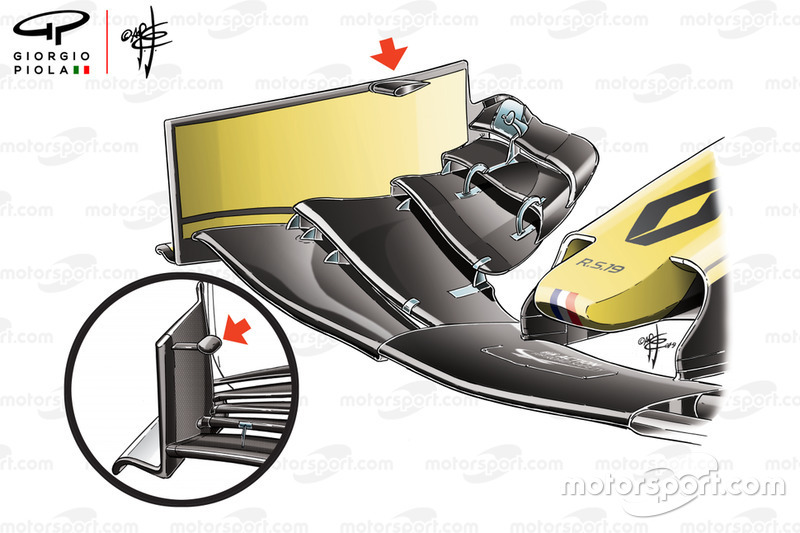 Renault also made a small alteration to the bargeboard, with the forward-most footplate element reined in. 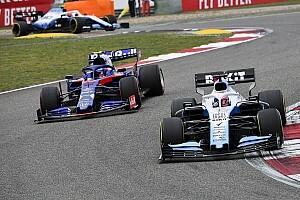 This is likely a response to the changes made to the front wing upstream which will have undoubtedly altered the shape and trajectory of the wake created by the tyre, allowing the bargeboard to work slightly differently too. 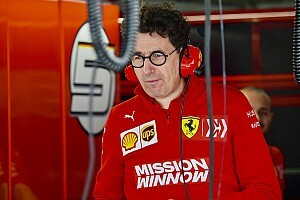 The teams have all come up with different ways of overcoming the regulation changes for 2019, with the design of the front wing and loss of the blown axle inhibiting their ability to create outwash. 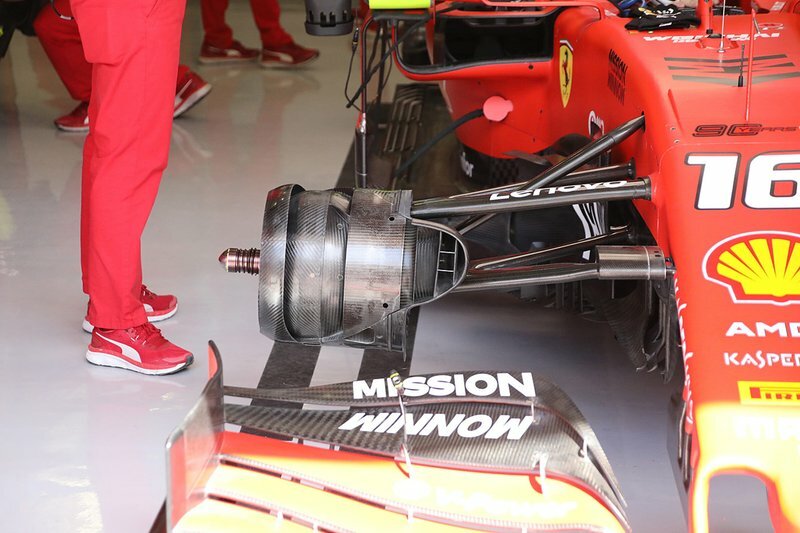 Ferrari have taken to a rather complex brake drum arrangement in an effort to recover some of the losses associated with the removal of the blown axle they’ve been using for several years (inset). As can be seen in the inset they already drew air from the inlet across the front face of their drum but have amplified this for 2019. 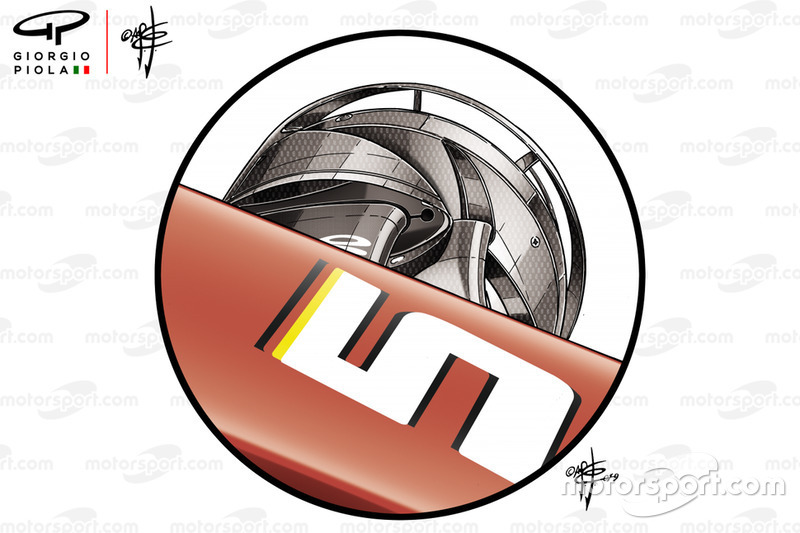 The crossover trench has been sunk much deeper and made much wider for 2019, with a hooped section on the outer edge of the drum used to define the airflows pathway once the wheel rim is fitted over it. As we can see from this front view, the large inlet brake scoop collects and distributes the airflow into several different channels, with the crossover trench apportioned the bulk of this flow. 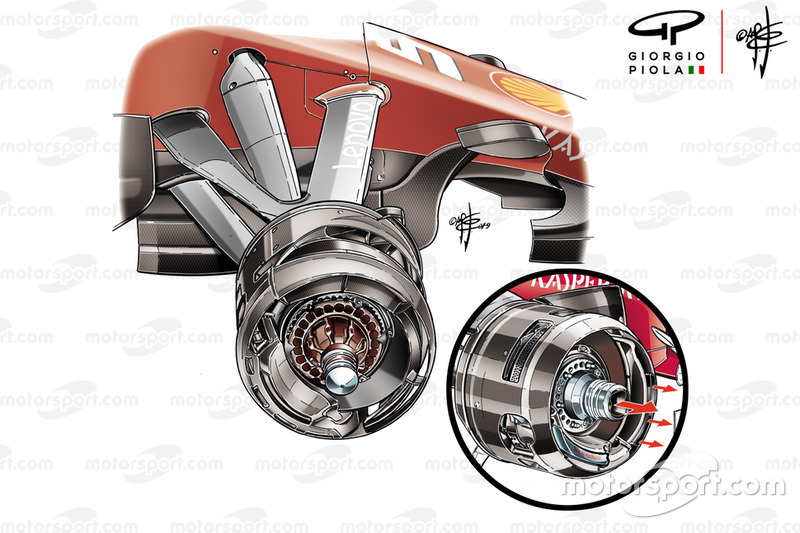 The airflow crosses the face of the drum and is exhausted out of the wheel rim's face - altering the wake created by the rim and tyres in an effort to improve flow downstream. Toro Rosso arrived in Bahrain with a new bargeboard design that featured three main vertical elements rather than one, whilst the footplate was also made a little shorter to accommodate a redesigned slotted splitter extension. 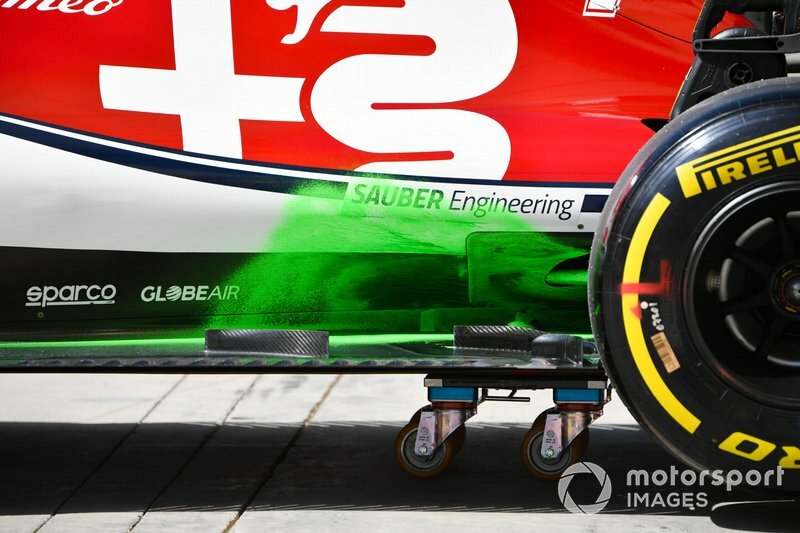 The Alfa Romeo C38 doused with flo-viz as the team analyses a new floor made available in Bahrain. The floor featured 18 fully enclosed and angled holes on the floors edge rather than the 12 used previously. Meanwhile, the angled fin ahead of the tyre now features a vertical slot and an extra vertical fin was added too. 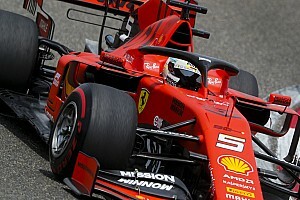 The team also made changes to the diffuser, ditching novel U-shaped outer fins for the now universally-utilised, fully-enveloped Gurney extensions. 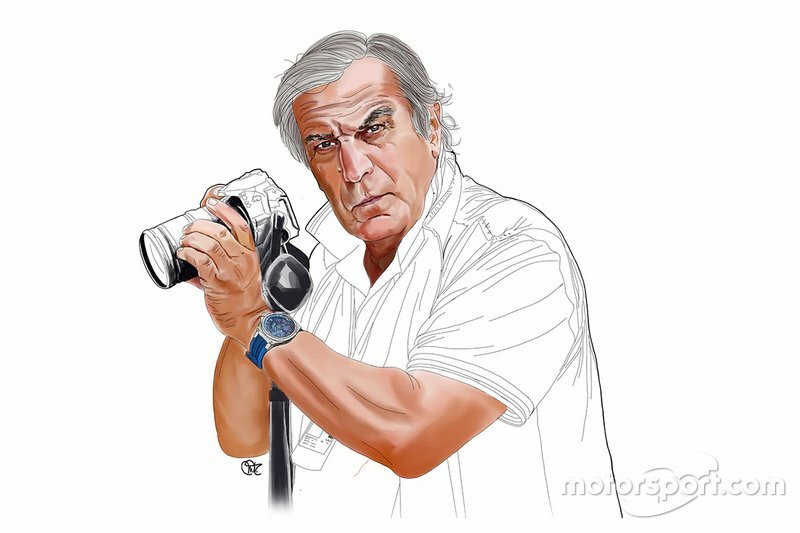 This change comes in tandem with a revised shaping to the outer channel of the diffuser and repositioning on the correlating strakes.